Find My Phone by Family Safety Production. A very interesting app with very interesting applications, this app allows you to track with varying degrees of accuracy a smartphone, your own or of a family member who previously acknowledged the app's request to track. After that, you can easily track on a map the smartphone's location. Even when Google offers a similar service, this app is much more user friendly and more useful, showing the locations of your family members or spouse, for instance. The most important thing to remember is that locations are mainly derived from cellular antenna triangulation, which means accuracy is not always that great. Score: A 4.5 out of 5. This app really works, but everyone must check for himself or herself if it works for his or her specific configuration with enough accuracy. Description: A location finding app that can locate a previously registered smartphone on a map and the user of the app can navigate to it. 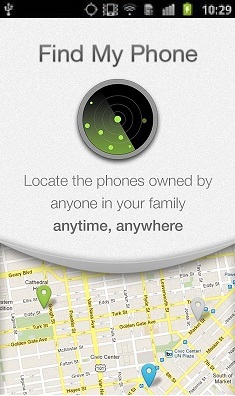 Good Points: Naturally, keeping track of family members and our own smartphone's location. A good UI with map and address in the USA to show the tracked smartphone's connection. Bad Points: Some problems reported mainly outside the continental USA. Locations updates are sometimes slower than needed. We understand this is to conserve battery power but maybe the user should be given a setting to adjust this period of time. In addition, sometimes locations can vary greatly or even jump, which makes tracking the smarpthone difficult. Experience: The testers all reported that installing the app and registering the smartphones to be tracked was fairly easy, as was understanding what to do. However, a few testers reported that some of the smartphones could not be tracked at times, with no obvious reason but on other times they could be tracked. Longevity: Medium. For those testers, mainly in the USA whose app worked perfectly, it became an everyday tool to find out where family members where. Those who had problems with it usually uninstalled it fairly quickly. Tracking apps are really needed these days. They help parents read the SMS’s, check out the location, get the access to the calls data, etc. Click keylogger mobile software to find more info!